Next of Kin: Son of Mrs Sophia Moilliet of Abbotsleigh, Malvern and the late Mr James Keir Moilliet. John Louis Moilliet was born in Malvern on the 26th March 1882, the son of John and Sophia Keir Moilliet of Abbotsleigh, Malvern. 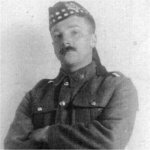 He emigrated to Canada in the early years of the Century and was a schoolteacher when he enlisted at Vancouver on 20th September 1915. He arrived in England with the 72nd Battalion (Seaforth Highlanders) on the 7th May 1916, having crossed the Atlantic on the Canadian Pacific’s Liner Empress of Britain (whose sister ship Empress of Ireland was involved in a collision in the St Lawrence River on the 28th May 1914 and capsized with a loss of life equivalent to that of the Titanic). Moilliet embarked for France in August, landing at Havre on the 13th. He served with the 72nd Battalion on the momentous attack on Vimy Ridge on the 9th April 1917. Here the Canadian troops succeeded where their French and British allies had failed in dislodging the Germans from their positions on the ridge. Moillet suffered shrapnel wounds to the jaw and was admitted to the 4th Stationery Hospital at Arques, St Omer. After a ten day stay, he was discharged and served at the front for another six weeks. On the 9th June he was sent on a two-week Musketry Course, but only a week after returning he was killed in action on the 29th June. He was buried not far from where he fell, and his mother received the news of his death a fortnight later.